Sophie Luck is currently playing Fly Watson in Blue Water High. 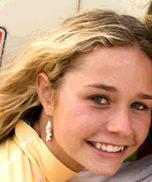 Some of her former roles were in Home and Away as Tamara, Sally's sister's daughter and in Don't Blame Me. Sophie won an AFI for her acting..
Info on her character, Fly.. Fly comes from WA and misses home. She is the youngest in both family environments. Fly is honest and isn't scared to prove herself. Fly likes Heath. The second Blue Water High series will be starting and she is one of the few old cast members that will be making appearances. Check out her interview video at the official Blue Water High site! Here is a picture above of Sophie in Blue Water High. I'll try to add some Blue Water High screen caps soon! We talked with BLUE WATER HIGH'S Kate Bell and Sophie Luck about what makes their friendship so great! TG: What's the nicest thing Kate/Sophie has ever done for you? Sophie: There are so many nice things Kate has done done for me! She always gives me advice. If i'm worried about something, she makes me feel like everything is going to be alright. She's like a big sister! TG: Awww! What do you love about each other? Kate: Sophie's so sweet and bubbly all the time and she's completely unspoilt. We've nicknamed her Tigger because she's so bouncy! She's a pint-sized ball of energy! Sophie: I love Kate's personality and her sense of humour. She has a presence about her! TG: What's the funniest thing each of you has ever done? Kate: [Laughs] We had a guy working on the show called Rama and we used to mess around with his name and call him Banana-Rama and Soph didn't get the joke and would call him Chocolate-Rama or Strawberry-Rama. It was really cute! Sophie: Kate does a lot of funny things! She always makes me laugh! What's something people don't know about each of you? Kate: Sophie learns her lines quickly! She's really fast. Sophie: Well, Kate's from the country! People might not know that. How are you both similar and different? Kate: We're similar because we can both be silly and we both have really positive attitudes and are generally happy people. we're different because Sophie has this boundless energy! [Laughs] Maybe because she's younger! Sophie: Kate's really smart and really articulate- I'm the complete opposite[Laughs] She's also really artistic and i'm not. We both love to have a great time - neither of us is really serious- and we both joke around a lot!